Are the wheels falling off the concept of herbicide rotation to manage resistant weeds? In recent years new ryegrass herbicides have been released, giving us some hope that there will be a herbicide solution to our problems. Imagine if your ryegrass was resistant to one of these fantastic new herbicides the first time you used it. We have seen this in the past and we may be about to see it again. AHRI researcher Dr Roberto Busi has previously shown us that low herbicide rates is not good practice as it can lead to faster resistance evolution for some herbicides. Roberto took some of the resistant ryegrass from his low dose studies and exposed them to some of the alternative new herbicides. 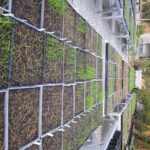 The alarming result was that the ryegrass was resistant to the alternative herbicides even though this ryegrass had never been exposed to these herbicides previously. Start with some nasty ryegrass – multiple resistant to Sulfonylurea, Fop (Diclofop), trifluralin and metolachlor herbicides. It is highly likely that this ryegrass has metabolic resistance to these herbicides. Next, expose the ryegrass to the new herbicide Sakura® (pyroxasulfone) at low doses four years in a row, each time collecting seeds from surviving plants, growing them and allowing them to cross pollinate with one another. Then, expose this ryegrass including herbicides Boxer® (prosulfocarb), Boxer Gold® (prosulfocarb + metolachlor) and Avadex® (Triallate). The result, a ryegrass population that is cross-resistant to six different herbicide modes of action including herbicides (Boxer®, Boxer Gold® and Avadex®) that the population has never previously been exposed to. Figure 1. Pyroxasulfone (A), prosulfocarb (B) and triallate (C) dose–response study of parental MR L. rigidum population and progenies obtained by four generations of pyroxasulfone recurrent selection. Standard herbicide-susceptible population VLR1, dotted line and empty circles; parental MR, continuous line andsolid circles; progeny MR4 selected 4 times with pyroxasulfone (once at 60 g ha−1, twice at 120 g ha−1 and once at 240 g ha−1), dashed line and empty circles; progeny MR4-P1, dashed-dotted line and empty diamonds. Wheat crop plants solid squares. Symbols are mean values of observed plant survival ± SE (n = 4). Lines represent the fitted log-logistic model. It is very likely that this ryegrass survives by metabolising the herbicides before they can reach the site of action. Ryegrass with metabolic resistance has high levels of a group of enzymes called cytochrome P450, and wheat has high P450 enzyme activity allowing it to tolerate most grass herbicides. However, at this stage we can only say the prediction is very likely, because P450 enzyme activity of this population has not been measured. There is a lot of evidence to suggest that this population is metabolic resistant. There may be hundreds of different P450 enzymes. There is now a global research effort under way that aims to better understand these enzymes and this mechanism of resistance. Is this possible in the real world? Roberto often comments that this is a worst case scenario as he has deliberately used research techniques that aim to select for multiple resistance to a number of herbicides. However, we would argue that this scenario is very likely to occur in the field also. We know that we have millions of hectares of herbicide resistant ryegrass in Australia with a long history of herbicide use and many of these populations will contain ryegrass with enhanced metabolism resistance. These populations are now being repeatedly exposed to the new herbicides that Roberto used in his study, year after year. These herbicides are soil-applied, pre-emergent herbicides. Their activity declines through the season as the herbicide is broken down in the soil, hence later germinating ryegrass are exposed to low doses of the herbicide. Consequently, many grain growers are now repeating Roberto’s pot trial on a massive scale in the field. It would be foolish to believe that the field result will be any different to Roberto’s pot trial. Same old message! Include a diverse range of weed management options that include non-herbicide weed control such as harvest weed seed control, crop competition and grazing to erode the ryegrass seed bank to very low levels. Growers who are implementing these strategies are winning the war – its just a matter of putting your mind to it. Herbicide rotation is still important but it is not a panacea. Herbicides are not the answer to herbicide resistance.